This series is no longer available. Please review the CL355A , or the CL750A as potential substitutes, or contact our Pressure Engineering Department. Controlling temperature parameters is the most important factor in assuring the quality, operational safety and reliability of industrial processes. Thermocouples, resistance thermometers and other temperature sensors, when installed in industrial processes, are subjected to mechanical, thermal and chemical stresses which accelerate their aging and eventual breakdown. Therefore, it is a recommended procedure to inspect, check and calibrate each sensor during the commissioning phase and at regularly scheduled intervals. The CL550, CL551 and CL552 series temperature calibrators are transportable units designed to provide a controlled temperature with high stability and high uniformity in all calibrator ranges. All units in this series come equipped with a permanent six hole block. Please see specifications for further details. A built in microprocessor-based controller handles the man-machine interface, the internal logic, and assures the high stability of the internal metal block through a sophisticated temperature algorithm. When better accuracy is required, the CL550 or CL551 temperature calibrator can be combined with an external high accuracy indicator (such as a CL526) and a Working Standard Thermometer. The CL550, CL551 and CL552 series temperature calibrators are equipped with a full bi-directional RS-232 digital interface for communication with personal computers. The temperature calibrator can be part of an automatic calibration system with a programmable cycle and the acquisition of data required to generate a full Calibration Report. OMEGA™ engineers are ready to support you with the system and software to fulfill your application requirements. 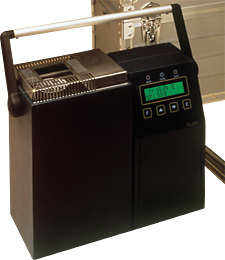 The CL550 and CL551 series can be used together with a Personal Computer, a multifunction high precision calibrator (such as the CL520 series) and a Calpman Windows software package to improve a true automatic temperature calibration system. Using the RS-232 interfaces of the instruments, it is possible to program through the PC the complete test procedure for your thermocouple or resistance thermometer to be certificated. The CL520 series calibrators are able to read the testing thermo-element with the desired accuracy, and the software calculates the errors and prepares the certificate. Diameter(s) 1/8", 3/16", 1/4", 5/16", 3/8", 3/4" 1/8", 3/16", 1/4", 5/16", 3/8", 3/4" 1/8", 3/16", 1/4", 5/16", 3/8", 3/4"
참고: Each unit comes complete with: operator’s manual, power cord, fuse and calibration certificate (NIST traceable). Add "-220V" to model number for 220 Volt power. No additional charge.